Our exclusive scout utilities and data editors for Football Manager 2016. World's best scouting tool returns for FM16. Extend the possibilities of finding, sorting and shortlisting players and staff on Football Manager 2016. Works with the 16.3.2 patch. FMEL 16 is a real time editor for use with Football Manager 2016 that enables you to edit essential person and club information on the fly. Compatible with the latest 16.3.2 patch. 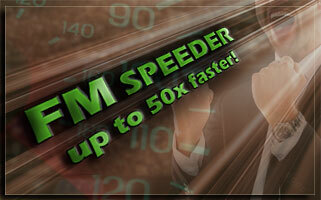 Increase your FM game-speed up to 50x faster! Video help available. Fully featured real-time scout utility and editor for Football Manager 2016 and Mac. Works with Mac OS X 10.7+ and the latest Football Manager and Football Manager Touch 16.3.2 version. FM Wizard Editor is a real-time editor for Football Manager 2016. Use it to edit player, staff and club data. Works with 16.3.2 patch. Looking for testers. Cross platform (Windows, Mac) save-game scout & editor. Supports FM 2016 and FM Touch 2016 (iOS, Android). With this online spreadsheet you can easily create your favorite FM players into FIFA. Handcrafted in Symi, Hellas. Page created in 0.261 seconds.